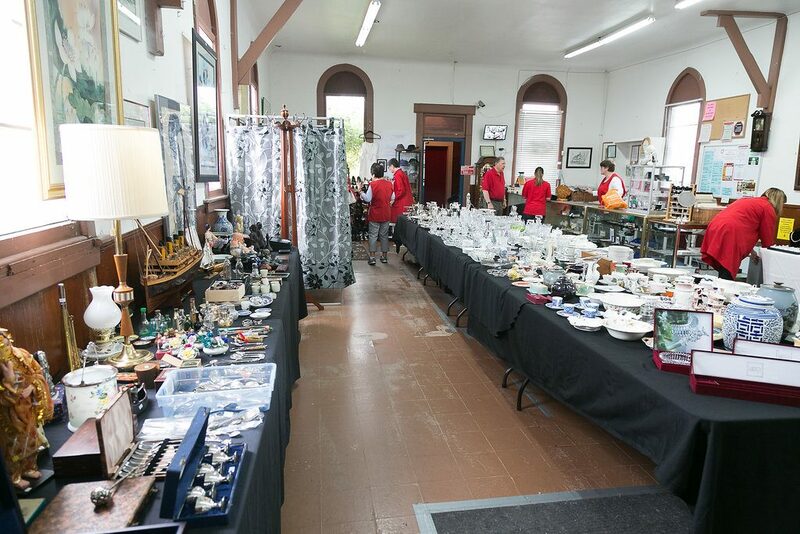 Our popular “Curio” sales are held 6 times a year featuring collectibles, artwork, china, crystal, silver, vintage clothing, jewellery and much more. 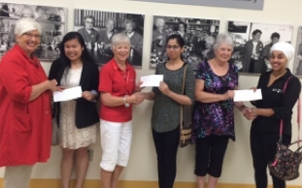 Revenue from our volunteer-run businesses allows us to support healthcare in Richmond, British Columbia. 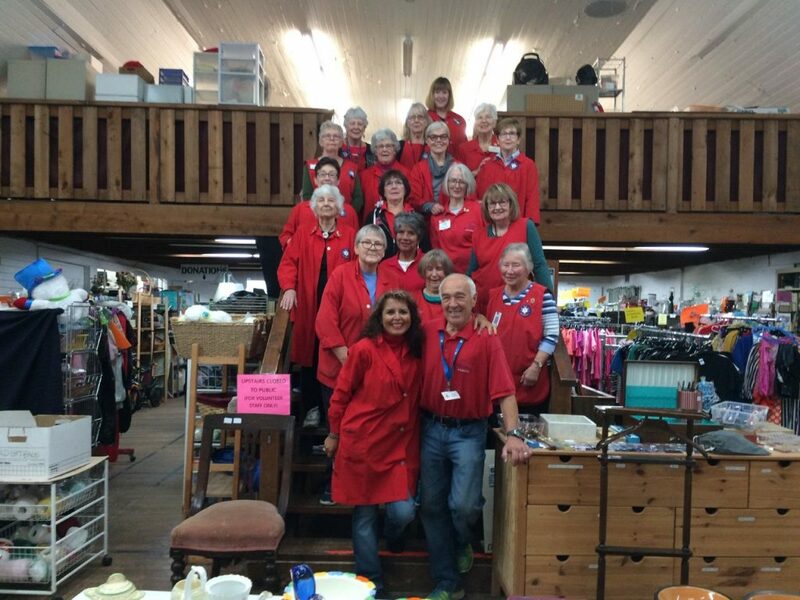 Located in Steveston (Richmond, B.C) at 3731 Chatham Street (corner of Chatham & Second Avenue), the Auxiliary Thrift Shop is an amazing store, 100% operated by more than 140 volunteers from ages 16 to 92! Here you will find gently used clothing for the entire family (also Boutique designer label and vintage), housewares, (dishes, lamps, drapery, linens), jewellery, books, toys, games, hardware, tools, electronics, sporting goods, craft supplies, art work and many other wonderful treasures, all at amazing bargain prices. All merchandise is donated by people in our community — and it changes daily. All items must be in good condition. 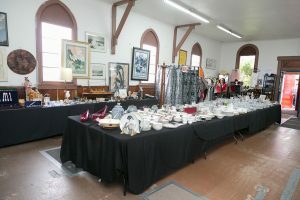 Proceeds from the Thrift Shop support the purchase of medical equipment and patient programs at Richmond Hospital, Minoru Residence and Lions Manor. The Thrift Shop could not run without the generous donations of all items by the community. We are grateful for this support. 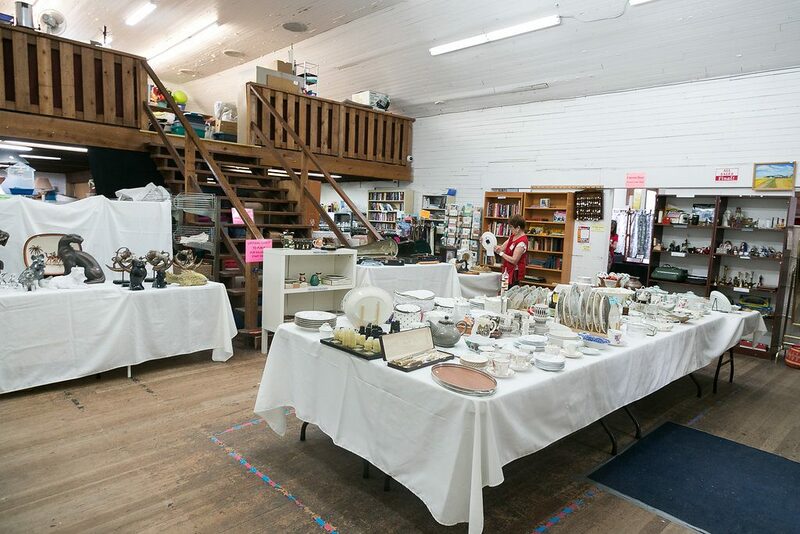 Please Note: After March 31st/19 the Thrift Shop will no longer receive furniture donations, due to space restrictions and we do not accept large appliances. 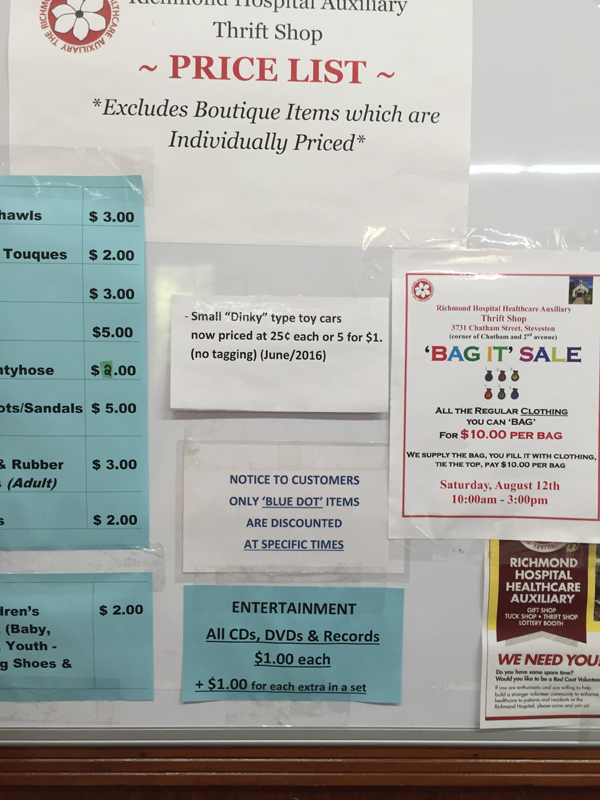 In addition to our everyday sales, we feature special sale days! 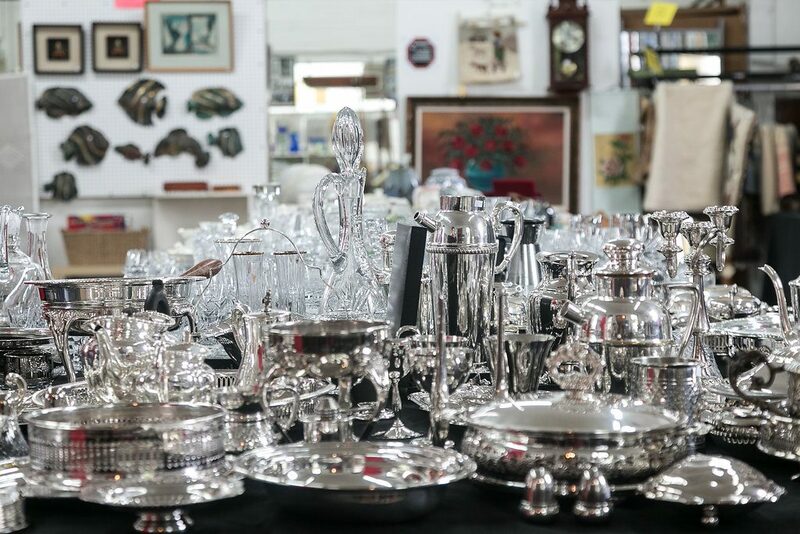 Our popular “Curio” sales are held 4 times a year featuring collectibles, artwork, china, crystal, silver, Boutique & vintage clothing, jewellery and much more. 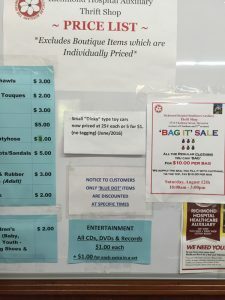 Throughout the year we hold special clothing sales where for $10.00 a bag, customers can fill a grocery size bag (we supply) with all the clothing they can stuff in and tie. It is possible to outfit every family member for very little cost. 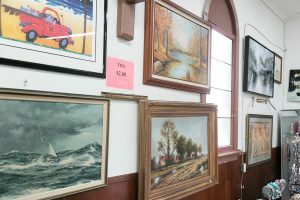 Every 2 months, the Thrift Shop holds a tool sale featuring drills, saws, hammers, and more, at bargain prices. It’s a handy-person’s delight because you never know what you will find. Christmas at the Thrift Shop starts in November and continues to Christmas. 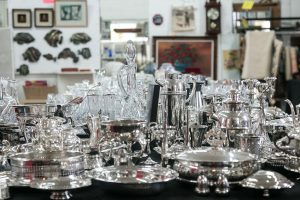 We sell everything Christmas – decorations, lights, music, DVDs, candles, mugs, plates, stockings, wrapping, and more. Every Sunday we feature a “surprise” half-price sale. 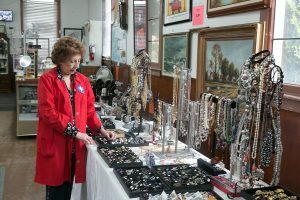 Sunday sales were instituted to help us raise money for our building renovation because they are operated outside of our normal shop hours. 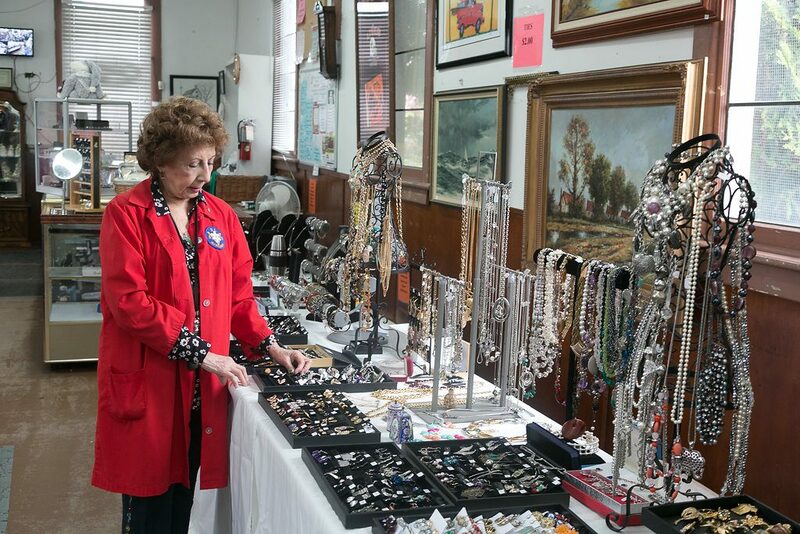 Sunday hours are 12:00 noon to 3:00 pm. The Thrift Shop is the place to buy everything Halloween. During October, we have a great assortment of décor and costumes for every member of the family at very low prices. 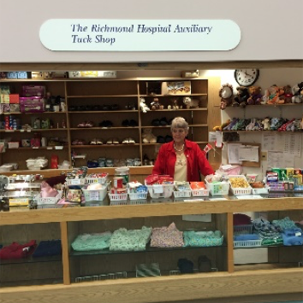 Our Volunteer run Gift Shop is in the main lobby of the Richmond Hospital. It offers an assortment of gifts, beautiful flower arrangements, jewellery, clothes, personal care items, snacks, magazines and more. 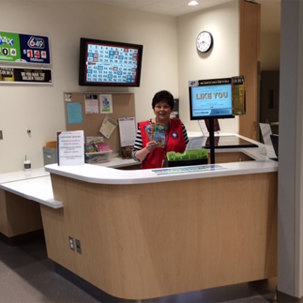 The Lottery Booth, located in the Hospital lobby, is another fundraiser for the Auxiliary and operated Mondays to Fridays by our volunteers. The Lottery Booth carries a full range of BC Lottery tickets. 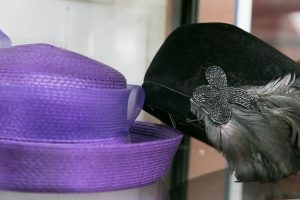 The Tuck Shop at Minoru Residence provides the residents with a variety of confectionary products and adaptive clothing. Volunteers also provide invaluable social interaction with the seniors living at the facility. Hours of operation may change for illness. JOIN US! WE NEED YOU! YOU CAN MAKE A DIFFERENCE! Do you have a few hours to spare each week (or even once a month) to volunteer? Volunteers from teens (16) to seniors are needed. You can pick your days, your hours and the place you want to work. Come and join our awesome crew of red coat volunteers! We welcome volunteers who can speak a second language such as French, Mandarin, Spanish, Dutch, etc. There are many ways you can get involved and be part of our volunteer team! At the Hospital, our volunteers assist in areas such as: ER, Surgical Day Care, Maternity, Cancer Clinic, Ambulatory, Diagnostic Imaging and Mammography, and as Navigators. They make a difference to hundreds of people every day! At the Thrift Shop: volunteers sort, price, display merchandise, cashier, interact with customers with a smile, and do a multitude of things. Work shifts are flexible ranging from one or more days a week (or monthly) with 3–6 hour shifts. Its your choice! 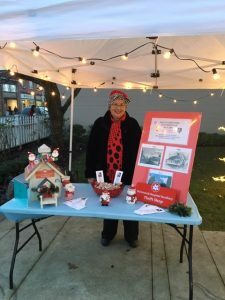 The Auxiliary also needs volunteers to operate our Lottery Booth. 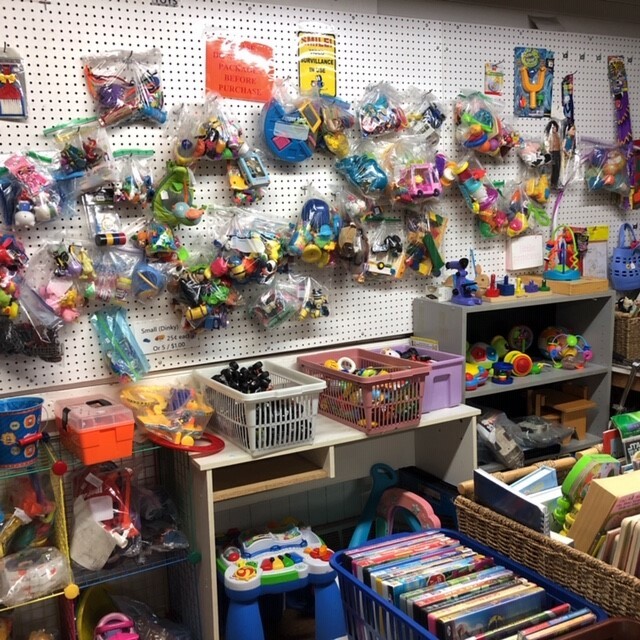 At the Tuck Shop located in the Minoru Residence, our volunteers sell an assortment of items for patients. 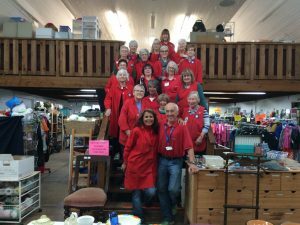 JOIN THE THRIFT SHOP TEAM! 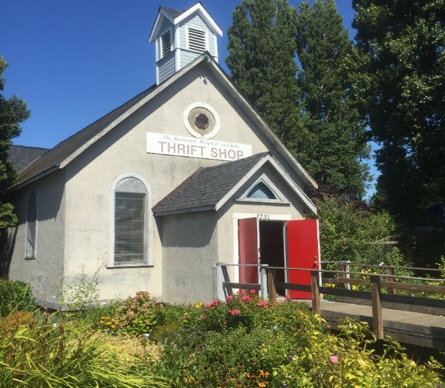 If you are interested in volunteering at the Thrift Shop, please fill out a Volunteer Application Form available at the link below or visit the shop at 3731 Chatham Street (Steveston) to pick one up. If you are interested in volunteering at with the Hospital team contact the Coordinator Volunteer Resources at (604) 278-9711 ext. 4731. 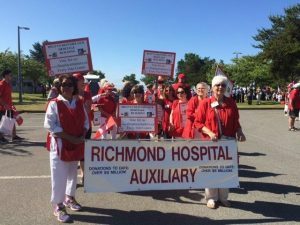 In the early 1960s, the “Richmond Auxiliary to the Hospital”, later the “Richmond General Hospital Auxiliary” grew from a group of interested citizens with a goal of raising money to assist with the building of a hospital in Richmond. 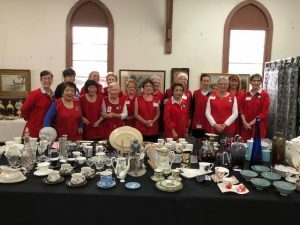 Approximately 16 various Auxiliary subgroups formed across Richmond and conducted a multitude of fundraising activities towards the cost of the building. 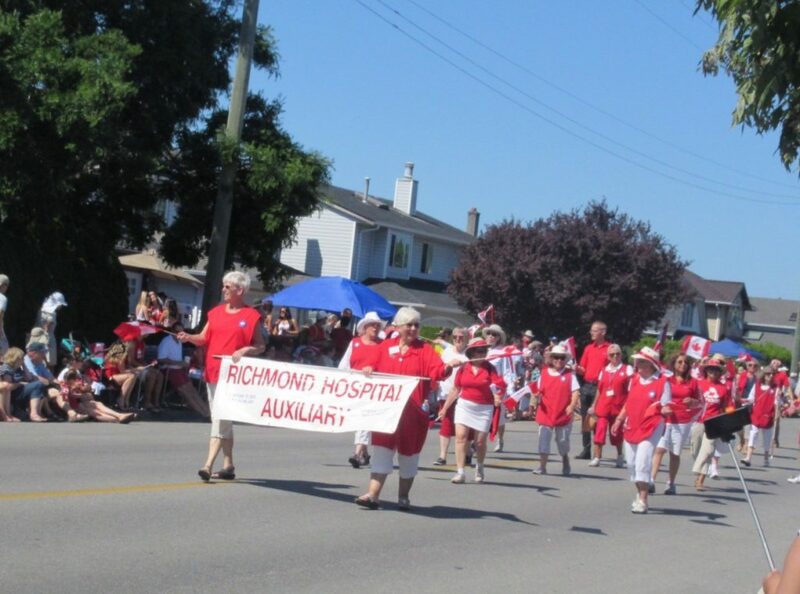 The Richmond General Hospital opened in 1966 and, over the years, the Auxiliary, now the “Richmond Hospital/Healthcare Auxiliary”, has continued to support the hospital. The Richmond Hospital Healthcare Auxiliary (RHHA), located in Richmond British Columbia, is an accredited member of the B.C. Association of Hospital Auxiliaries (BCAHA). 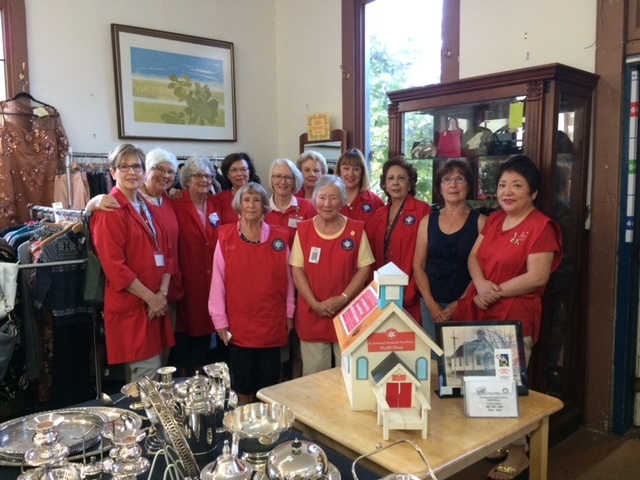 The Auxiliary has more than 440 “red coat” volunteers who donate their time, talent and skills in many areas in the hospital and in the operation of venues such as the Thrift Shop (in Steveston), Gift Shop and Lottery Booth (in the Hospital), and the Tuck Shop (in Minoru Residence). 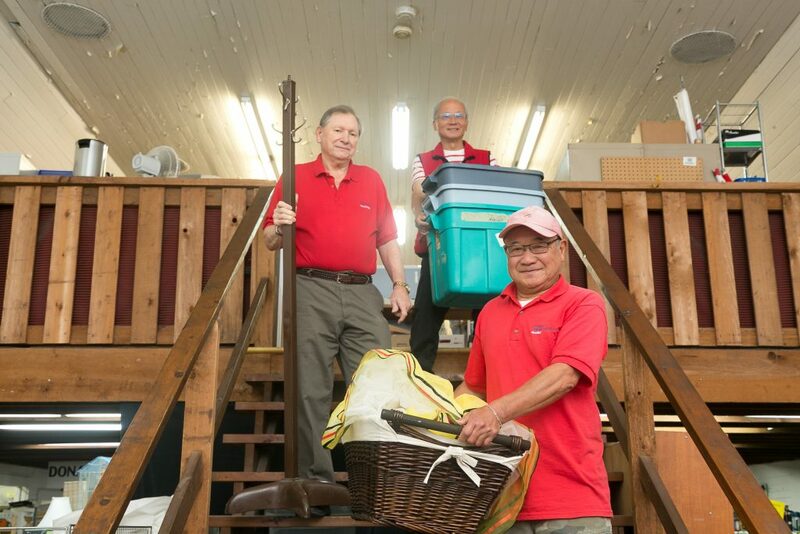 We also have volunteers at Minoru Residence and Lions Manor. In a given month, our Auxiliary members volunteer an average of 2,742 hours per month (that’s a whopping 32,921 hours per year!). To date, our Auxiliary has donated more than $8 million to enhance healthcare in Richmond. 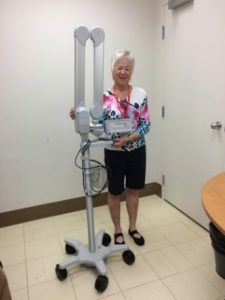 Some of the funds raised by the Auxiliary are used to help with the purchase medical equipment at the Richmond Hospital through an annual grant. 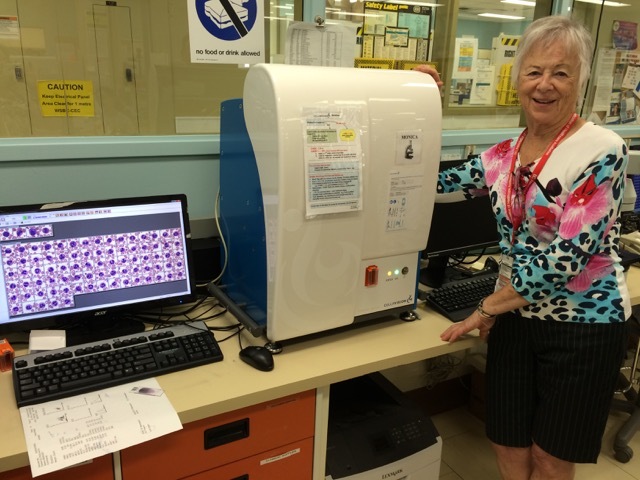 This money has allowed for the purchase of a Cellavision to assist in detecting cancer blood cells, a Vein-Finder Machine to help technicians find difficult veins in patients for blood testing and much more. 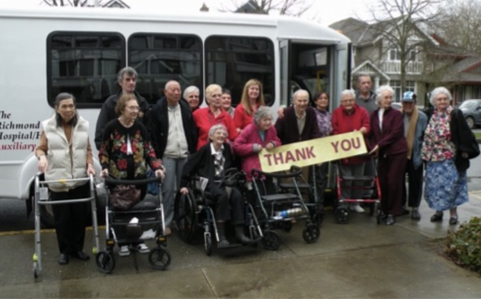 Programs we have helped to fund include a short stay Paediatric Unit, a program to teach patients how to care for themselves on the 3North Sub-acute Unit, Speech, Music and Recreational Therapy, Alzheimer training tools, the set-up of a Dental Clinic at Minoru Residence, 2 Patient Buses at the residences, annual Student Bursaries in healthcare, and much more. One of 2 buses purchased by our Auxiliary. The other is at Minoru Residence. 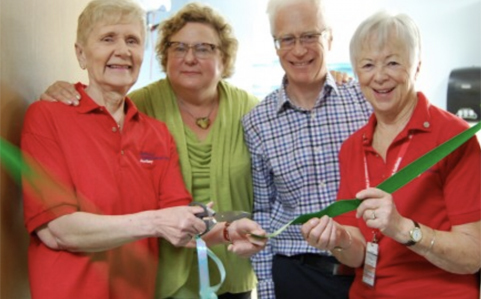 In 2015, thanks to the financial support of the Richmond Hospital Healthcare Auxiliary, and in partnership with the UBC Geriatric Dentistry Program, seniors at Minoru Residence and those coming from Richmond Lions Manor, now have access to a state-of-the-art dental clinic on-site. While the Auxiliary outfitted the space with more than $100,000 worth of dental equipment, UBC Dentistry provides the clinical expertise (dentists, hygienists and assistants) to residents who require dental care. 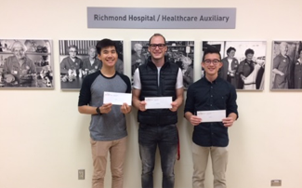 Annually, the Richmond Hospital/Healthcare Auxiliary awards 3 bursaries to post secondary students entering their second or subsequent year in post-secondary education in health-care. 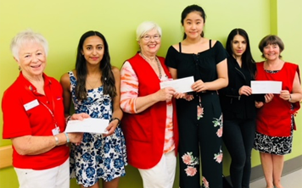 The bursary program, generated by funds raised by the Auxiliary, was started as a meaningful way to give back to students who volunteer their time. 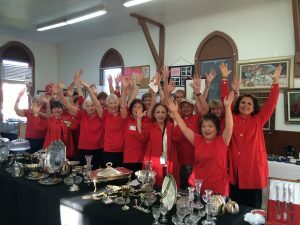 The Auxiliary Board considers scholastic success, volunteer achievements, financial need, character, references and a certified statement of marks. 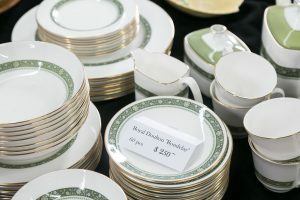 Thrift stores play a significant role in recycling in more ways than you think. It all begins with the donation of goods brought to us by the public who do their part in helping the environment instead of disposing unwanted items to landfill. 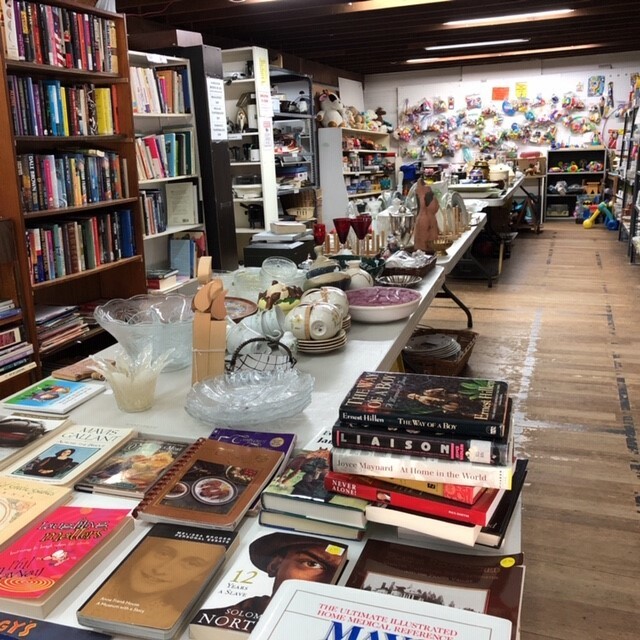 In turn, our Thrift Shop resells donated items, giving them a new life, and through sales we are able to support healthcare initiatives in Richmond. 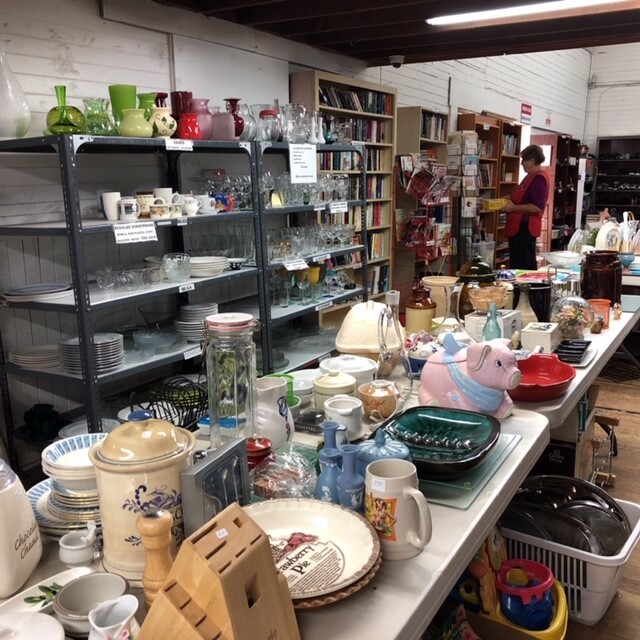 For our customers, buying second-hand clothing and household items eliminates shipping emissions and packaging that would normally go to landfill and it’s a thrifty way to clothe a family with a limited budget. In cases where the shop is unable to use certain donations, we do our best to recycle what we can by sorting plastics, metal, cardboard, etc. and selling it at a nominal price to recycling companies. 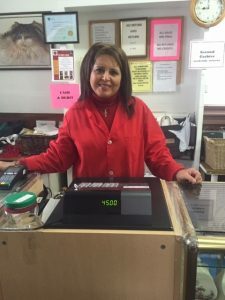 We also divert from the landfill by donating un-saleable clothing to third world countries, since we pride ourselves in selling only goods which we consider to be “gently used” and of good quality. 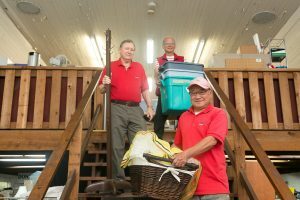 During 2017, our Thrift Shop was able to divert 5,201 kilograms of goods and saved 18.4 tons of carbon. We also helped to save 147,705 litres of water, 95 trees, and 22,854 kWh of electricity through our partnership with Urban Impact Recycling Services. 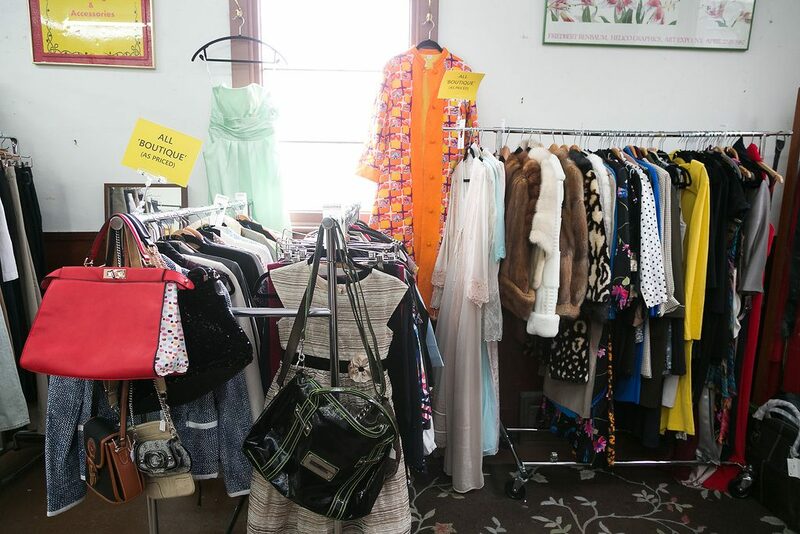 Buying from the Thrift Shop follows the main principals of environmental friendliness – recycle and reuse to reduce the carbon footprint– and save money. In 2017, our Auxiliary purchased an historic building in Steveston, BC, which we had been renting for the past nine years. Built in 1894 as a Methodist Church, it is the oldest church still sitting on its original site in Richmond. The primary heritage value of the Steveston Methodist Church is its historical association, as a church building, with the Methodist Indian Mission. 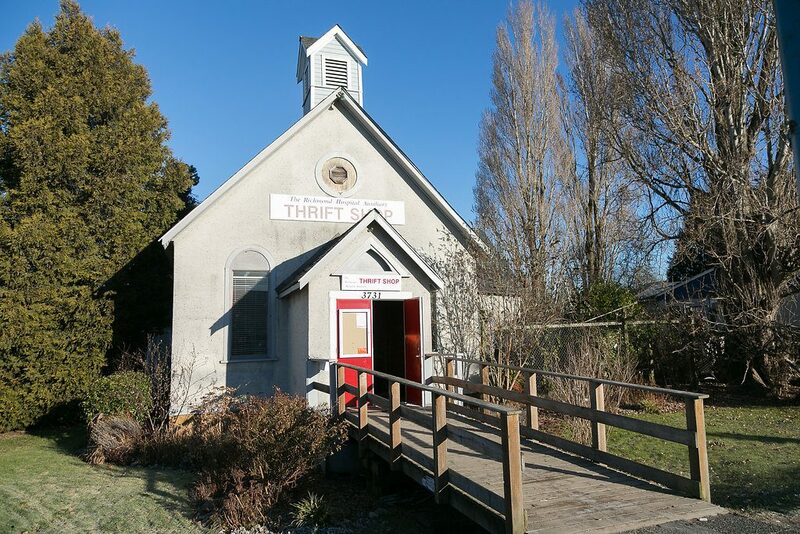 Built entirely by volunteer labour, the Mission was deeply committed to working among First Nations peoples in Steveston including Japanese Canadians working in the canning and fishing industries. 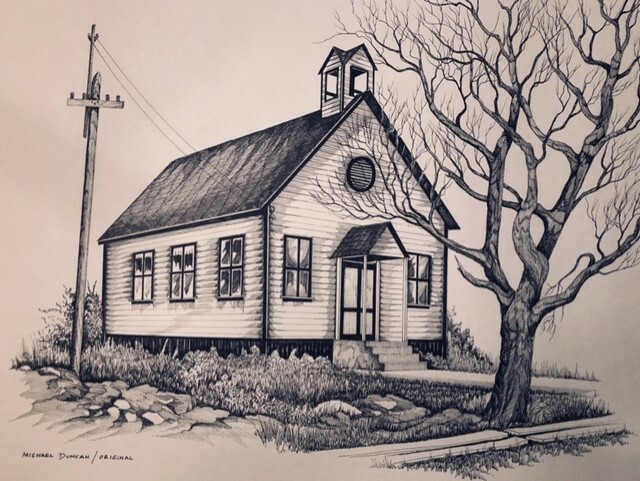 Its architectural style reflects the modest early church structures which served Steveston. 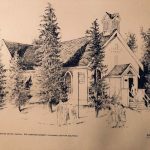 It is also historically connected to the United Church through the union of several church groups in 1925. Years later, the building became a bicycle shop. In 2008, the building became a 100% volunteer run Thrift Shop run by the Richmond Hospital/Healthcare Auxiliary who raise money to support the Richmond Hospital and other healthcare programs in Richmond. 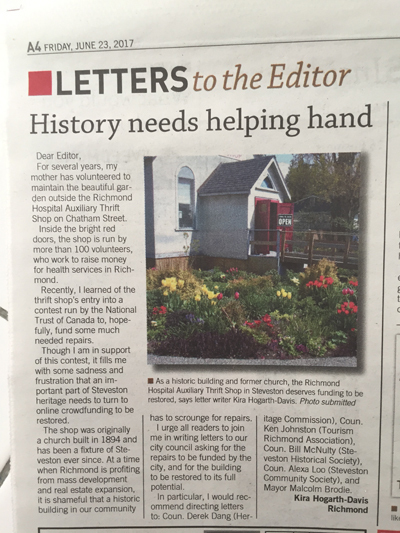 People in the Steveston/Richmond community were very happy to hear that our Auxiliary had purchased 3731 Chatham Street and that our plans are to restore the building rather than to demolish it. The building stands as an important landmark in our community and the work we do inside to help further healthcare in Richmond is equally important. 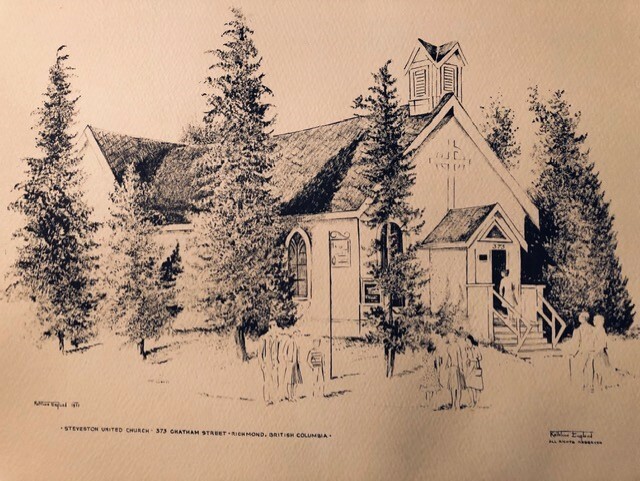 Key elements that define the heritage character of the site include an architectural style that reflects its original use as a church, including its T-shaped plan, front gable roof and façade. Originally, the building had clapboard siding but sometime after 1953 it was covered in stucco. There is a central bell tower and a gable entry porch. 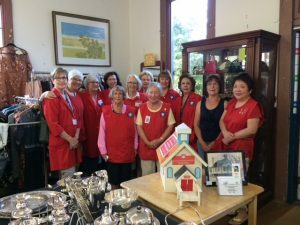 With the new purchase, our Auxiliary would like to restore the building to its origins, as much as possible, while continuing to use it as a Thrift Shop. The renovation list is long. The building needs major foundation work to maintain stability, new electrical panel, a new (flat) floor, upgraded plumbing and heating, and the removal of the outside stucco replacing it with clapboard. In addition, the bell tower, which is one of the outstanding features atop the building also needs to be replaced as well as a new front door modelled after the original and new “church” windows. We also need a redesign of the inside to make our Thrift Shop more efficient and attractive to our customers and more than 100 volunteers. We have set up a “Restoration Advisory Committee” consisting of Auxiliary members with expertise in construction and associated disciplines who have a passion for seeing 3731 Chatham Street restored, while improving the space utilization of the Thrift Shop. The success of our restoration will mean that this 123-year-old building will remain standing as a reminder of Steveston’s past, recognizing also, the history of First Nations and Japanese-Canadians in the community who have walked through its doors for comfort. 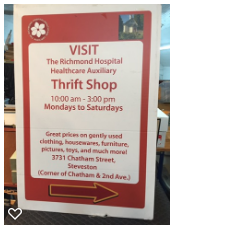 Today, the building is being used to help people in the community through the Thrift Shop’s significant support to the Richmond Hospital and other healthcare programs in the Richmond community. 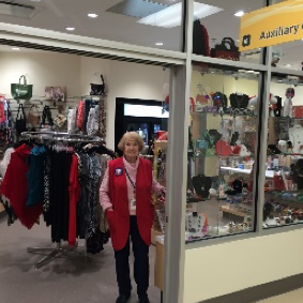 Our Auxiliary has given over $8 million to the Hospital to assist with its establishment and every year we provide support for medical equipment and other healthcare programs. 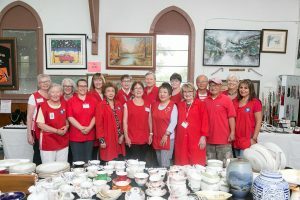 Such as the set-up of a dental clinic for the elderly, music therapy programs, alzheimer’s training tools and buses for Minoru Residence and Lions Manor, and much more. 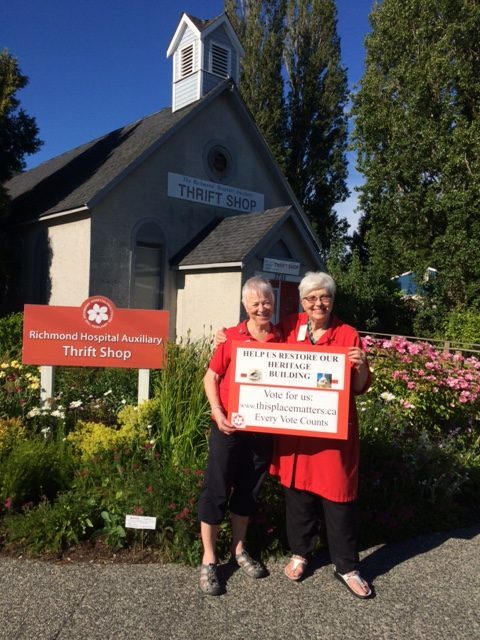 Revenue earned at the Thrift Shop will continue to be earmarked for the Richmond Hospital to support healthcare in the community, but we are also in need of assistance from the public to finance our renovations. Please watch our 2 minute video below for more information! 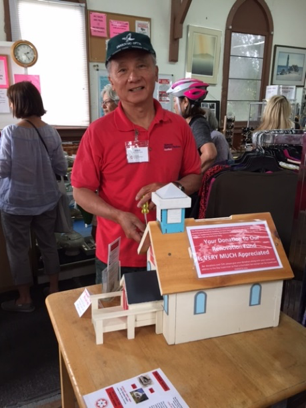 A replica of our building, built by one of our volunteers, has been very popular with customers coming to our Thrift Shop who wish to make a donation to our renovation. 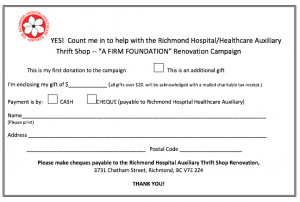 If you would like to donate to our “Firm Foundation” Renovation Campaign, either by stopping by the Thrift Shop or mailing a cheque, we would be very grateful! You can download and use the form below.